The reporter has done his homework, in spite of him not knowing the Japanese language besides maguro and kawaii. He’s found some reviews of our eatery on TripAdvisor and even an old photo of me, my parents, and my uncle in front of our restaurant on a small street off of Nagaregawa-dori. I stifle a cry. I even have that same photo on my phone, but to see that a random stranger was able to download it makes me feel that a deep private part of my personal life has been cut out and displayed for all to see. “Excuse for a moment,” I say and run back into the kitchen. “Ah, did I say something that I shouldn’t have?” I hear the reporter comment to Tamio. Then Tamio’s low and soft voice. I don’t know how much of my parents’ tragic car accident that he’s sharing. Probably none of it. We’re the same that way. My phone vibrates in my jeans pocket. I take it out to see who has sent me a text. It’s Risa. Lovely, dependable Risa. Ever since Frederick kicked us out of his apartment, she’s been living with three other NYU students in a one-bedroom near campus. It’s cramped, but since they are stage designers, they’ve created lofts and other private places. It’s pretty magical. She also texts in English now. And she insists that we try to talk to each other in English as much as possible, but we always end up in Japanese, especially after some Kirin, Cuevo Gold, and cheap chardonnay. Some things will never change. ☹. I RAN OUT OF INTERVIEW AFTER HE SHOWED ME MY PARENTS FOTO. 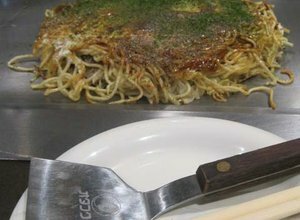 When Tamio went downstairs one morning from the two-bedroom apartment we were both living in, he discovered a line of people were waiting to get a bite of “oki-doki.” That evening he moved all his books into my room to make a permanent place for the grill and my okonomiyaki tools. “It would do you good to read a book or two,” he said to me at the time. I wonder what my parents would have thought of KT’s As You Like It. The space was clean, at least, with a beautiful wood sign hanging from the ceiling. Risa had found a large piece of driftwood and she sliced it and burned our name and slogan into it. Tamio was actually able to get the proper licenses pretty easily because he had already been thinking of adding a grill in his place. But he was anticipating preparing ribs and hamburgers. Definitely not anything from Japan. I listen to Tamio answering the reporter’s questions for a while. I wonder if the reporter might be interested in Tamio. It would be good for him to have some kind of social life. The guy’s a total nerd and workaholic. And I have to admit that he’s kind of rubbing off on me. He doesn’t know it but I’ve actually been reading some of his books at night. The poetry of Langston Hughes is a little above my comprehension, but I’m finding that I like another author, James Baldwin. I’ve even written one of his quotes in my journal: Love does not begin and end the way we seem to think it does. Love is a battle, love is a war; love is a growing up. “I’m Japanese myself. On my mother’s side,” Tamio says to the reporter. When I hear that, my heart melts. Tamio hardly ever compliments me verbally. But I feel the same about him. 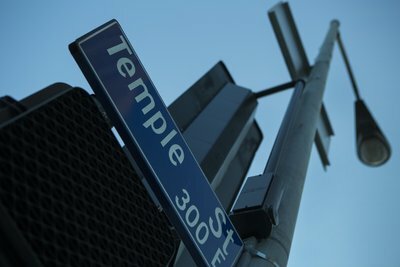 Return next month for the mystery serial, “Trouble on Temple Street,” featuring LAPD bicycle cop Ellie Rush.